Books & DVDs to get you started! The creator of the blog My Plastic-Free Life provides personal anecdotes, stats about the environmental and health problems related to plastic and personal solutions, handy lists and charts and tips on how to limit one’s plastic footprint and get involved in community action. 2. Plastic purge : how to use less plastic, eat better, keep toxins out of your body, and help save the sea turtles! / Michael SanClements. Reap the benefits with this easy-to-follow advice. Plastics are divided into 3 categories: the good, the bad, and the ugly – shows you how to embrace the good (items like your phone or medical equipment), avoid the bad (i.e. food storage containers and toys that contain toxic chemicals), and use less of the ugly (single-use plastic that’s just plain wasteful). 3. Recycle : the essential guide / edited by Duncan McCorquodale and Cigalle Hanaor. A basic introduction to the how’s, what’s, when’s and where’s of recycling. Sections on recyclable materials; Paper, Plastic, Metal, Glass, Household Waste and Compost. Each material is explained in depth; how it is sourced, its impact on the environment, how the recycling process occurs. Includes a variety of stories, facts and suggestions for inventive reuse in the home. 4. Plastic ocean : how a sea captain’s chance discovery launched a quest to save the oceans / Capt. Charles Moore with Cassandra Phillips. A seafaring environmentalist shares his shocking discovery of the Great Pacific Garbage Patch, and inspires a fundamental rethinking of the Plastic Age. Charles Moore set sail from Honolulu and took a shortcut through the North Pacific Subtropical Gyre. He stumbled upon the largest garbage dump on the planet–where plastic outweighed zooplankton, the ocean’s food base, by a factor of six to one. Moore recounts his ominous findings and unveils the secret life and hidden properties of plastics. 5. Make garbage great : the TerraCycle family guide to a zero-waste lifestyle / Tom Szaky, Albe Zakes. This engaging volume shows how we all can cut down, reuse, and repurpose our garbage. Examines the materials we use in our daily lives, shows how they impact the environment, and provides project ideas to lessen our impact. Packed with information, photographs, and 20 DIY projects. 6. Plastic : a toxic love story / Susan Freinkel. In this probing look at how plastic built the modern world–and the price the world has paid for plastic–journalist Freinkel points out that we’re nearing a crisis point and gives readers the tools needed through lively anecdotes and analysis. 7. Junkyard planet : travels in the billion-dollar trash trade / Adam Minter. An engaging, colorful, and sometimes troubling tale. Travels deep into a vast, five-hundred-billion-dollar industry. Minter traces the export of America’s junk and the massive profits that China and other rising nations earn from it. “Junkyard Planet” reveals that Americans might need to learn a smarter way to take out the trash. How do we end up eating plastic bags? What is “e-waste”? What happens to our old mobile phones and computers? The amount of waste produced by human activity increases globally year after year. This book examines how effective we really are at recycling these huge amounts of unwanted materials. Original ideas on how to save money and the planet. Her ideas are even fun! Adopt an eco-friendly lifestyle without either losing your mind from the soul-destroying guilt of using a plastic bag because you forgot your reusable ones (again), or becoming a preachy know-it-all whom everyone loathes from the tips of her organically-shampooed hair to the toes of her naturally sourced recycled sandals. 10. Recycling and managing waste / edited by Justin Healey. Australia may be a large country, but we live in a throw-away society that is rapidly filling with our waste. Reveals the extent of our growing waste problem and examines the waste and recycling practices of households, and includes many tips on how to reduce, reuse and recycle. Topics include green waste, plastics, glass, paper, metal and electronic waste (e-waste). What can you do to reduce your impact on the environment? Where do the bags and other plastics end up, and at what cost to our environment, marine life and human health? Follows ‘everyman’ Jeb Berrier as he navigates our plastic world. Jeb is not a radical environmentalist, but an average American who decides to take a closer look at our cultural love affair with plastics. Crude oil seeps invisibly into almost every part of our modern lives. It is the energy source and raw material that drives transport and the economy. Yet many of us have little idea of the incredible journey it has made to reach our petrol tanks and plastic bags. 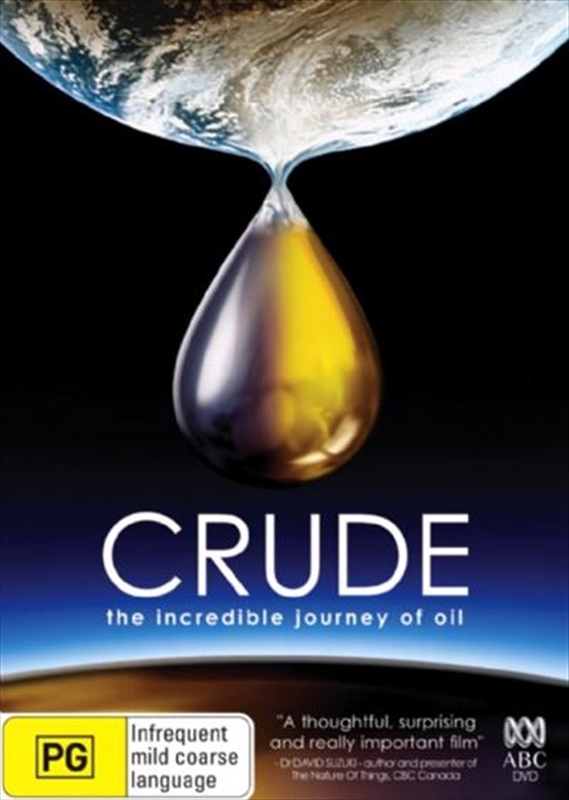 Coming in the wake of rising global concerns about the continued supply of oil, and increasingly weird weather patterns, Crude spans 160 million years of the Earth’s history to reveal the story of oil. Filmed on location in 11 countries across five continents. If you are looking for further inspiration – check out the Plastic Free July Website. They have a section on how to Live with less Plastic. Also have a look at the ABC Series War on Waste. Youtube! – Christmas Delights cooking event. Beautiful post Cherie, so much here I have been reading all about going plastic free! It is really powerful to personally make a commitment to go plastic free – and even a small step like using less single use drinking straws can spark lifelong changes. It’s something really close to our family as we see so much waste washing up in the rockpools near our favourite beaches. Thank you for your reply. I think once you start on the plastic free journey you realise how much we use everyday without thinking. You may also be interested in a new DVD that we are currently processing – it is called Straws and is produced and directed by Linda Booker.